Is this your child's first year playing in a formal cricket program? Your participant pack will include a shirt, bucket hat, plastic bat and rubber ball. The shirt, bucket hat and rubber ball will be delivered to your home address and the bat will be available for collection at the program. All items will be delivered within 7 - 10 business days. If you selected 'I don't know' you will receive a pack aligned to your nearest Big Bash League club. Change the name displayed on the shirt. I do not want to disclose my child's name on the shirt. Size 2 bat is recommended for children less than 137cm tall. Size 3 bat is recommended for children greater than 137cm tall. Assisting with the program is a great way for parents to get back some family time with their kids, learning and having fun together. How might you be able to assist the program coordinator from time to time? 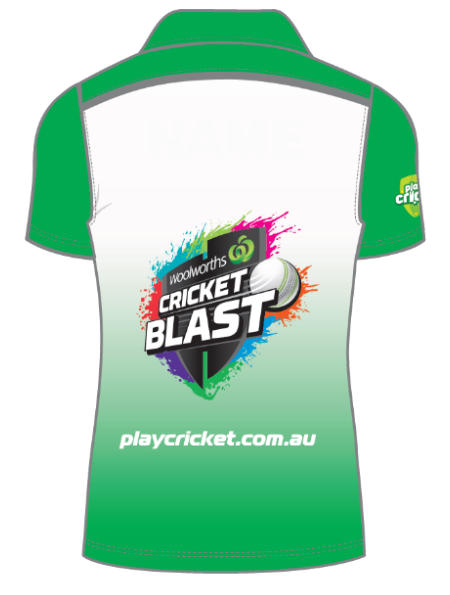 How did you find out about the Woolworths Cricket Blast - Junior Blasters Program? Collecting specific information about our participants allows us to let you know about representative opportunities you may be eligible for including regional, state and national teams. This information will also provide us with a better understanding of our player diversity, help us to increase participation, and support the development and delivery of cricket programs across Australia. Is there anything specific that can be done to assist your child to participate? 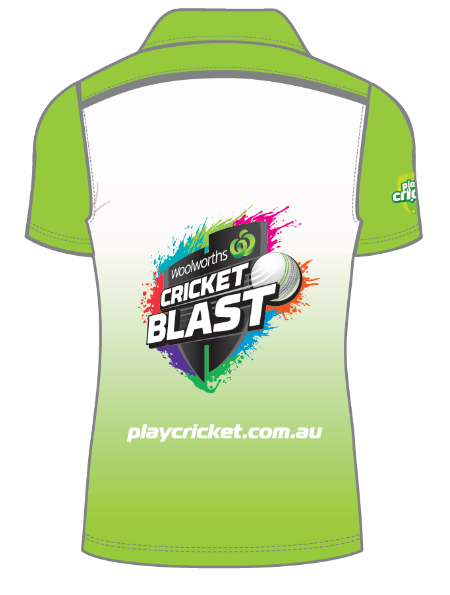 Your child will receive a participant pack when they are registered to Woolworths Cricket Blast - Junior Blasters. Which pack would your child prefer? What club in the KFC Big Bash League does your child support? Does your child identify as Aboriginal and/or Torres Strait Islander? Were either of your child's parents born overseas? Does your child have a physical, intellectual or sensory impairment? Is there anything that can be done to assist participation? I have read and agree to the Woolworths Cricket Blast – Parent/Guardian Acknowledgement, including the Talent Release Statement, Indemnity and Release Declaration and (if applicable) At-Match Activity terms. I agree to be bound by any Codes of Behaviour and policies of my Club for the time being in force, including Australian Cricket’s ‘Looking After Our Kids’ Code of Behaviour for Affiliated Associations and Clubs. I am a parent or guardian of the Woolworths Cricket Blast participant who is the subject of this registration (the Participant). I (for myself, my heirs, executors and administrators) agree both on behalf of the Participant and in my own right that: (i) we give our permission to Cricket Australia (CA), the Participant’s home State or Territory Cricket Association (State Association) and their partners, representatives, agents and assigns (Authorised Parties) to use, reproduce and publish in any communication medium whatsoever television and photographic image/s of the Participant obtained from participation in the Woolworths Cricket Blast program (the Program), as determined by the Authorised Parties (jointly or severally) from time to time, for educational, community cricket, promotional, commercial or marketing purposes; (ii) the foregoing permission is unconditional and applies in perpetuity; (iii) no fee or remuneration will be provided for the Participant’s appearance in any such communication mediums; and (iv) I and the Participant waive, release and forever discharge the Authorised Parties from all claims, actions and liability relating to its use of said television and photographic image/s. I am responsible for organising transportation of the Participant to and from the Program and indemnify the Association, CA and Woolworths for all liability and costs associated with my failure to arrange for the prompt collection of the Participant after the designated finish time of the Program. I acknowledge that participation in the Program involves inherent risks, hazards and dangers including the risk of injury and risks associated with heat and exposure to the sun. I agree on behalf of the Participant and in my own right, to absolve, indemnify and keep indemnified CA, the State Association, and Woolworths and their directors, officers, employees, volunteers, sponsors and agents involved in the Program against all costs, losses or damages however caused arising from or in relation to the Participant’s participation in the Program. I agree both on behalf of the Participant and in my own right, to waive, release and forever discharge CA, the State Association, Woolworths and their directors, officers, employees, volunteers, sponsors and agents involved in the Program from all claims and/or causes of action that I or the Participant have or may have (including for negligence) arising from any injury, loss or damage of any kind suffered by the Participant including personal injury, illness or death and/or loss or damage to any property (in so far as this does not breach the provisions of the Trade Practices Act) arising either directly or indirectly out of the Participant’s participation in the Program. I authorise registered Program coordinators to arrange medical or hospital treatment (including, without limitation, ambulance transportation) if I am not available to do so and I indemnify the State Association, CA and Woolworths for all associated costs. At-Match Activity (eg. at BBL and International Match venues): If the Participant is selected and attends a Woolworths Cricket Blast on-ground activity at an Australian Cricket match venue (At-Match Activity) I agree to the At-Match Activity Participation Terms attached. (RISK WARNING AND ACKNOWLEDGEMENT) I acknowledge and agree that my and/or the Participant’s participation in the At-Match Activity involves participation in a sporting activity, similar leisure-time pursuit or another activity involving physical exertion or physical risk and that I and/or the Participant will undertake the At-Match Activity for the purposes of recreation, enjoyment or leisure. The At-Match Activity may involve entry onto the field of play and/or another area with risks specific to that area, and I understand that there are inherent risks, hazards and dangers associated with such participation in the At-Match Activity, including but not limited to those listed below, and that I and/or the Participant may suffer serious injury, or even death, as well as property loss or damage as a result of my participation. I acknowledge that this is a risk warning as applicable under the Civil Liability Act 2002 (WA), Civil Liability Act 2002 (NSW), Australian Consumer Law and Fair Trading Act 2012 (Vic), Civil Liability Act 2003 (QLD), Fair Trading Act 1987 (SA) Civil Liability Act 2002 (TAS) (the “State Consumer Laws”) and any other applicable law. Risk of strike from a cricket ball. Risks related to heat and exposure to the sun. Risks associated with playing cricket. Risks associated with moving between seat and onto the field. I understand this list is not exhaustive and there may be other risks inherent to the At-Match Activity. I am at least 18 years old and have voluntarily elected to, and requested the Operators allow me and/or the Participant to participate in the At-Match Activity. I freely and voluntarily assume all risks associated with myself and/or the Participant participating in the At-Match Activity and acknowledge that participation is entirely at their and my own risk and that I may withdraw myself and/or the Participant from the At-Match Activity at any time. I am, and the Participant is, physically and medically fit enough to participate in the At-Match Activity. I am not aware of any medical condition, impairment, disease, illness or other reason why I or the Participant should not participate in the At-Match Activity. To the fullest extent permitted by law, I indemnify and will keep indemnified the Operators and each of their directors, officers, employees, volunteers, promoters, independent contractors and agents (the “Operator Parties”) against all costs, losses or damages however caused, arising from or in relation to my or the Participant’s participation in the At-Match Activity. To the fullest extent permitted by law (including section 139A of the Competition and Consumer Act 2010 (Cth) and, as applicable: , section 5J of the Civil Liability Act 2002 (WA), section 5N of the Civil Liability Act 2002 (NSW), section 22 of the Australian Consumer Law and Fair Trading Act 2012 (Vic), section 19 of the Civil Liability Act 2003 (QLD), section 42 of the Fair Trading Act 1987 (SA), and/or section 20 of the Civil Liability Act 2002 (TAS)), the Operator Parties exclude all liability (including in relation to any warranty or guarantee) arising from any loss or damage suffered by me or the Participant in connection with the At-Match Activity, including in respect of any death, physical or mental injury (including aggravation, acceleration or recurrence of such an injury), contraction, aggravation or acceleration of a disease or coming into existence, aggravation, acceleration or recurrence of any other condition or occurrence that is or may be harmful or disadvantageous to me arising from the At-Match Activity not being supplied with due care and skill or not being reasonably fit for purpose or for any breaches or failure of any consumer guarantees under Commonwealth law in the form of Schedule 2 to the Competition and Consumer Act 2010 (Cth) (the "Australian Consumer Law") or the State Consumer Laws, or due to negligence by any of the Operators or Operator Parties or for breach of contract. To the fullest extent permitted by law, the Operator Parties' liability to me or the Participant for a breach of any non-excludable guarantee is limited to a refund for any fees paid in connection with my or the Participant’s entry into the venue. Nothing in this document excludes, limits or modifies the application of the Australian Consumer Law or the State Consumer Laws or the exercise of any rights or remedies conferred by the Australian Consumer Law or the State Consumer Laws where to do so would contravene the Australian Consumer Law or the State Consumer Laws. I consent to myself and the Participant receiving and to pay for any medical treatment (including without limitation, ambulance transportation) which is considered by the Operators to be advisable or deemed reasonable before, during or after the At-Match Activity. I indemnify and will keep indemnified the Operators for all costs associated with this medical treatment. I am fully responsible for any loss or damage to, and the security of my and the Participant’s personal belongings before, during and after the At-Match Activity. I agree to and will procure that the Participant obey and accept the At-Match Activity rules and any other instructions issued by the Operators at any time. I agree not to, and procure that the Participant will not, do anything which may adversely affect, prejudice or bring into disrepute the reputation of any of the Operators or the venue. I acknowledge that my and/or the Participant’s participation in the At-Match Activity is at the sole discretion of the Operators and accept that the Operators may cancel or postpone the At-Match Activity or may remove me and/or the Participant from the venue immediately at any stage if I fail to comply with the terms of this release and waiver or otherwise and I will not be entitled to any compensation for that cancellation or postponement or to any refund in relation to any amounts paid by me or the Participant to participate in the At-Match Activity or attend the venue. I acknowledge that my and/or the Participant’s participation in the At-Match Activity is not transferrable to any other party. Venue Operator means the operator of the venue where the At-Match Activity takes place including, at their respective venues: SCG - Sydney Cricket and Sports Ground Trust (ABN 91 480 447 937), Stadium Australia - Stadium Australia Management Limited (ABN 11 069 692 253), Spotless Stadium - Royal Agricultural Society of NSW Foundation Limited (ABN 84 124 177 608), Gabba - Stadiums Queensland (ABN 53 690 873 374), WACA - Western Australian Cricket Association (ABN 44 026 744 769), Adelaide Oval - Adelaide Oval SMA Limited (ABN 46 141 259 538), MCG - Melbourne Cricket Club (ABN 92 871 871 964), Etihad Stadium - Melbourne Stadiums Ltd, Manuka Oval - Territory Venues and Events (ABN 88 078 876 508), Blundstone Arena - Cricket Tasmania (ABN 34 009 476 993). I acknowledge that I and/or the Participant participating in the At-Match Activity have read and understand the warnings set out in this document pursuant to an applicable State Consumer Law that apply to a participant in any recreational enjoyment or leisure activity in the relevant State to which the State Consumer Law applies. This organisation is not allowing on-line payments. If you prefer to pay cash, payments will be accepted at junior registration day to be held on Sunday 18th August 2015. MILO in2CRICKET is the first step in Johnny's cricket journey from backyard to Baggy Green. The MILO in2CRICKET program will commence Saturday 3 November @ 10:00 AM. Tell a friend about MILO in2CRICKET. Tell a friend about Woolworths Cricket Blast . Enjoy a fantastic night out with your family at the BBL. You might want to consider Junior Club Cricket. Please take a moment to check that this is the most appropriate program for your child. A comparison of the MILO in2CRICKET program and Junior Club Cricket can be found here. You might want to consider MILO in2CRICKET. Please take a moment to check that this is the most appropriate program for your child. 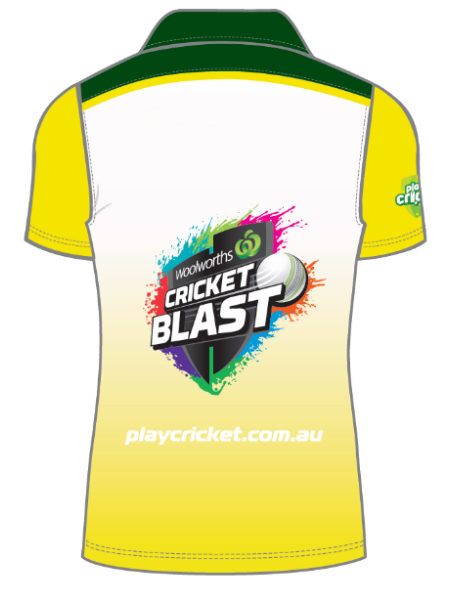 A comparison of the MILO in2CRICKET and MILO T20 Blast programs can be found here. 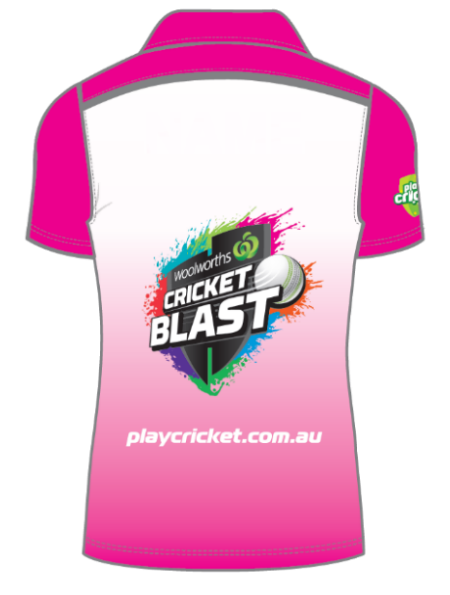 You might want to consider MILO T20 Blast. Please contact the nominated person at your selected club to discuss whether this program is suitable for your child. 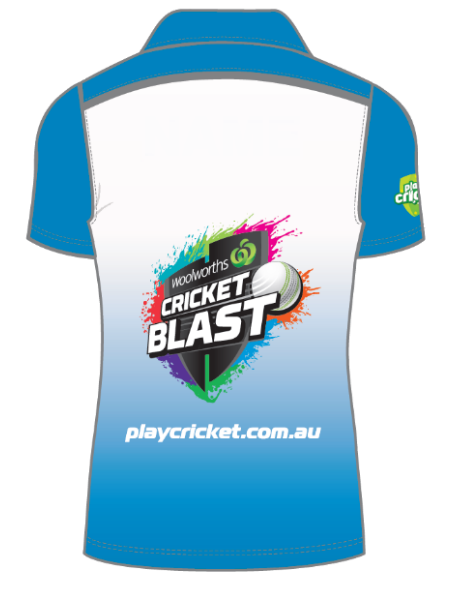 You might want to consider Woolworths Cricket Blast - Master Blasters program. Please take a moment to check that this is the most appropriate program for your child. A comparison of the Woolworths Cricket Blast program can be found here. Please take a moment to check that this is the most appropriate program for your child. A comparison of the Master Blasters program and Junior Club Cricket can be found here. You might want to consider Woolworths Cricket Blast - Junior Blasters program.